The Stormcaller has a respectable neutral game, an above-average super, and has slowly been on the rise in the Crucible. This guide will help you make the most of what the Stormcaller has to offer. The Stormcaller melee is Thunderstrike. Like all Warlock melees, it has exceptional range, and will deal 122 damage on a hit. As far as upgrade choices are concerned, the 1st option is ‘Chain Lightning’ which lets your Thunderstrike chain to another nearby enemy. Even if there are multiple enemies nearby, this will ONLY chain to one enemy for 50% of the original melee damage (61 dam). Not really an ideal perk for PvP, as this probably won’t be helpful very often. Next is Amplitude, which increases the range of Thunderstrike. This is a great perk, and with Amplitude, Thunderstrike becomes the farthest-reaching auto hit melee in the game, beating out the other warlock subclass ranges, as well as the hunter blink strike. Using amplitude together with max-range shotguns is a *very* effective combination, allowing you to pull off shot-melee kills from really far out. 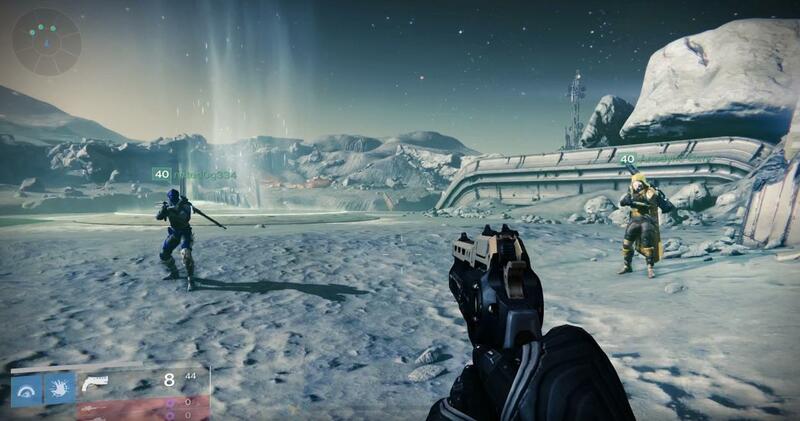 This perk is almost universally accepted as the must-use PvP choice, and for good reason. Last option is ‘Rising Storm’, which reads: Hits with Thunderstrike charge your super, ability and melee energy. By how much? Hardly at all. 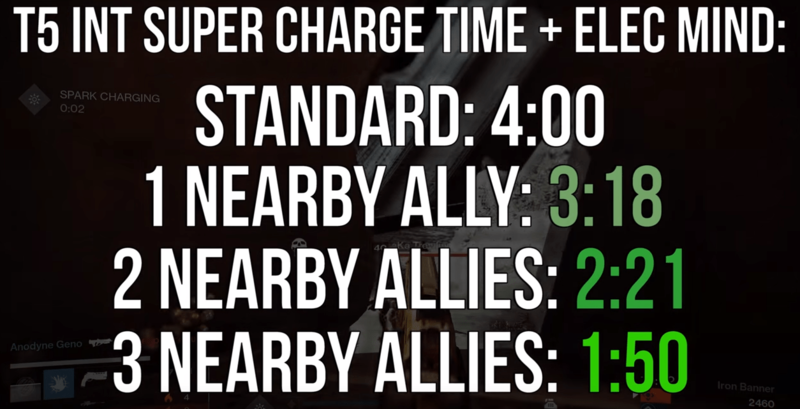 In terms of charging your super, a standard T5 INT Stormcaller charges Super in 4:00. With 1 hit of Thunderstrike, Rising Storm brings that down to … 3:59. Yes, a 1 second reduction. Same was true with both 2, and 3 hits. 1 second per hit. Same with Discipline – T5 DISC grenades recharge in :25. With one hit of Rising Storm, its reduced to :24. Amplitude should essentially be used at all times, hands down. The only part of the Stormcaller overall game that is relatively lacking. 1st option is the Pulse grenade borrowed from Striker Titan skilltree. The pulse nade will detonate on contact with any surface and emits 4 pulses at 61 damage each. Difficult to use offensively, but decent at preventing opponents from chasing you, and briefly blocking off choke points. Next is the Storm Grenade, which calls down a concentrated lightning storm that covers a large area and can deal up to 183 damage if an enemy happens to be caught in the center. Like the pulse grenade, this is great at preventing enemies from chasing you. Using offensively is difficult, but the large damage-zone helps. Last up is the Arcbolt grenade which will hit automatically if an enemy is within range, hits for 91 damage, and can chain to nearby enemies. While 91 damage is the weakest option, I still prefer this grenade for the reliability/accuracy factor. The goal is to either pick off a weak enemy around a corner/fleeing, or to open with this grenade, then finish off the opponent with fewer shots than you normally would need. Stormtrance is a highly annoying/effective wandering super which allows you to drift about, zapping foes with auto-hit lightning that deals up to 219 damage-per-second 73 dam per zap, 3 zaps per second, as well as receive an incoming 50% damage reduction. This lightning can also chain to other, nearby enemies for half-damage. Your standard Stormtrance duration will be between 13-16 seconds. 13 seconds if you hold down the trigger to spam nonstop lightning (which drains your bar quicker), or 16 seconds if you don’t send out any lightning at all. Remember, you can still throw grenades while you are in Stormtrance mode. There are 3 direct upgrade options, and the 1st is Landfall, which shoots a lightning bolt out under you upon Super activation, which results in a one hit kill. Despite the popularity of people using it while airborn, this perk will still activate if triggered at ground-level. Ionic Blink is more appealing and allows you to teleport on command when using Stormtrance. Ionic Blink is a great way to carefully approach enemies and avoid getting hit while zapping. 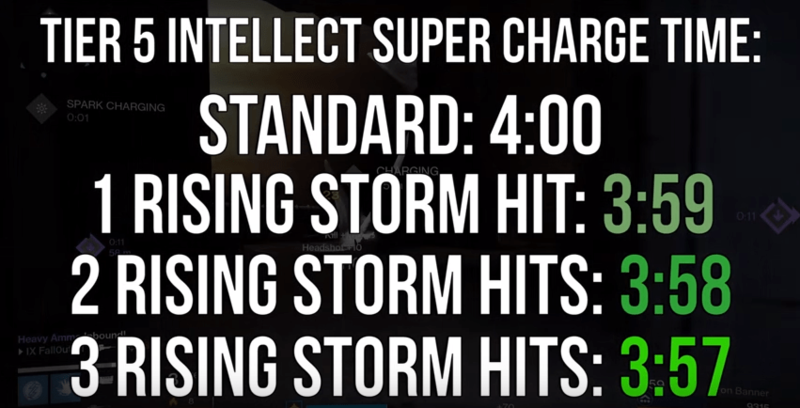 Last choice is Superconductor – “Doubles Stormtrance lightning chaining capabilities.” Normally Stormtrance can only hit a max of 4 enemies in PvP at one time, even if there are more enemies within range, so using Superconductor allows you to bypass that limitation. When critically wounded, this perk triggers a pulsewave that boosts speed for you and your allies for 9 seconds, as well as your weapon handling and reload speed. Great perk for Stormcaller neutral game, as you’ll see the benefits of this a lot per match. Incoming melee attacks recharge and intensify your melee ability. The ‘intensify’ is relatively strong, deals 122 – 182 damage, and lasts for 4 seconds. When cast with full grenade/melee energy, Stormtrance restores your health and lasts longer. Having health restore is dandy, but how much does this make Stormtrance last? With Transcendence, it’s 24 seconds! If your goal is to abuse Super in 6v6 gametypes, this is what you want. Stormtrance charges faster when allies are near. When active, nearby enemies take damage. The DoT that nearby enemies take is kinda weak at 14 damage per second, in the form of repeating tics of 7 damage each. Not bad, but you’ll probably be too busy frying people to see this minor chip damage pay off in a match. This ability caps off at 3 allies. Any more will result in the same time of 1:50. For 3v3, it’s still useful, but not as much as it will be in 6v6. Enemies damaged by grenades will cause chain lightning to nearby enemies. Every time you’re damaged by a grenade, chain 44 damage to a nearby enemy. This can potentially take the Arcbolt up from 91 damage to 135, and the Storm Grenade from 183 to 227. Grenade kills recharge your melee, melee kills recharge your grenade. If you’re looking to boost the Stormcaller neutral game, either Perpetual Charge or Arc Web are both fine choices. Claws of Ahamkara – Grants an additional melee charge. Amplitude-boosted melee is incredibly useful in PvP, and having the ability to utilize 2 melee charges is perfect for all Stormcaller or any other subclass. Voidfang Vestments – Respawning with full grenade energy is an option that should never be overlooked. The Ram – Survive through various grenades, additional weapon shots, and a whole list of other situations that would kill any regular Warlock. Light Beyond Nemesis – Faster revives all around, best in Skirmish, Salvage, and Trials of Osiris. The Impossible Machines – Grants ‘Landfall’ for free, meaning that you can use both Landfall and Ionic Blink together. If you’re looking to boost your Super game in a big way, look no further.